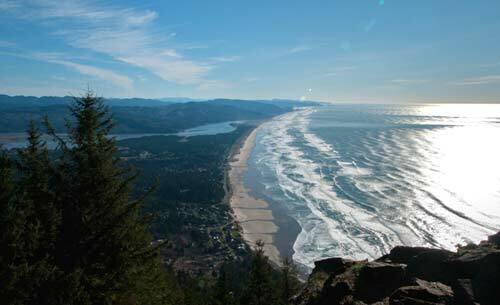 (Manzanita, Oregon) - UPDATED: Certainly the viewpoints at Manzanita's Neahkahnie Mountain are among the most impressive of the Oregon coast: on a clear day you can see forever. They may actually pale in comparison, however, to the high vistas of this looming presence over the laidback town. It's the trail to the top that wins those accolades, bringing you to the highest point possible above the state's beaches. (Photos courtesy Tiffany Boothe, Seaside Aquarium). 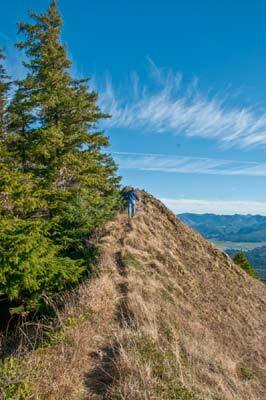 His take: What’s not to like about hiking up Neahkahnie Mountain? “I’d venture that pretty much anyone, even if they never hike (as long as they are in reasonable shape) would love or at least really enjoy this trip,” Lorain said. It’s three miles roundtrip to the top, about 1600 feet, which all starts at a trailhead between milepost 41 and 42, not far the southern overlook with the pyramid-looking rock. There’s a trailhead sign by the highway that takes you up a gravel road just a little to the trailhead. 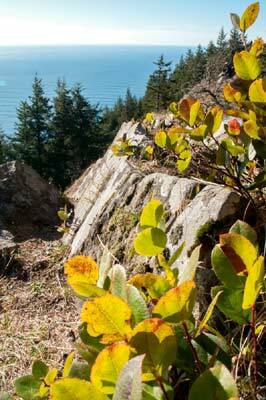 Almost a mile up, through sometimes steep switchbacks and misty forest, you come to a ridge. Along the way things get pretty incredible fairly quickly. Several stunning viewpoints pop out and at least one has a bench. From the ridge, it’s another .6 miles to the very top where you come out onto a meadow and more breathtaking views of the water world below. To add more excitement to the sojourn, you can head down the other side of the mountain that meets up with a trailhead about a mile south from the main trailhead. But wait, there’s more. 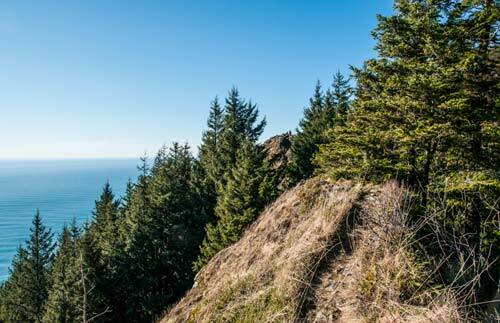 Lorain has an insider’s tip to hiking this trail. 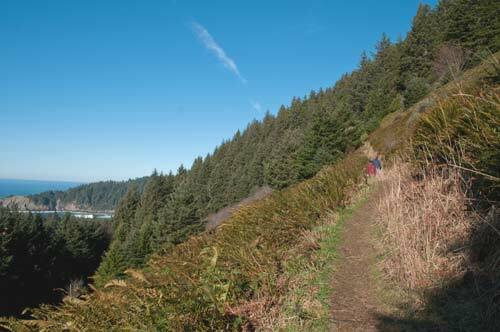 He suggests parking at that gravel lookout between Oswald West State Park and the main trailhead, which is where the backside trail comes out. Here, it’s insanely beautiful even if you don’t hike anywhere: you can see parts of Cape Falcon and the top of Cube Rock from here. Then there are the grand summit views in this spot. Down there, you’ll encounter the freaky Devil’s Cauldron, a kind of gigantic hole in the cliff where you can look down. Walk to the right from the gravel parking lot and you join the trail to Short Beach. Walk straight west and you’ll find Devil’s Cauldron, as well as the full sight of Cube Rock and another oddity called Pulpit Rock. Walk to the left and it takes you down some brush-covered slopes to ragged basalt structures that look like cathedrals that had been through a nuclear explosion. A small sci-fi movie was filmed there a few years back. Lorain mused this caused an interesting and slightly humorous moment while hiking once. “Oh, there’s a big flower, strange that it’s moving, but let’s go get it anyway,” he said. That Coast Trail not only brings you down to Short Sand Beach after almost a mile and a half, but then you can come out in the middle of Oswald West. The trail then morphs into the wild Cape Falcon trail, and that in turn can lead you to Arch Cape after another few miles. Many hikers will take either a southside jaunt back down the mountain through a forest service road or that that northern backside route to the gravel lookouts, or some of the longer routes. Lorain has some cautions about this, however.